In Your Cups -Or- Happy New Years!! HAPPY NEW YEARS !!!!!!! 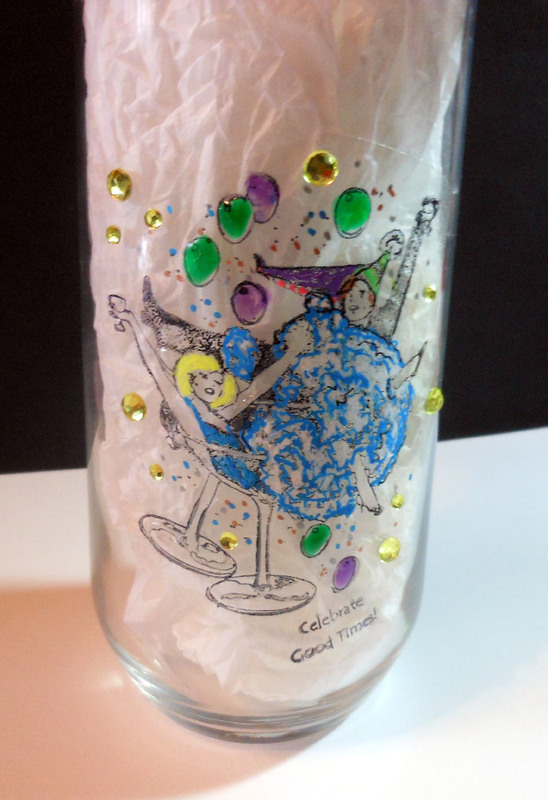 Bring in the New Years with a personalized glass! Great for birthdays, or other special occasions or no occasion at all. Create a favorite glass for everyone in the house! Stamp image on clear, acid-free acetate. Put white paper under so you can see the image well. I used StazOn ink, pressed stamp straight down and lift straight up. Start to color the image using Gelly Roll Pens of all sorts, plus - Gallery Glass Stain Glass Paint. Usually you need leading outline, but if you are careful and do one area, let dry, and go to the next; it works well. 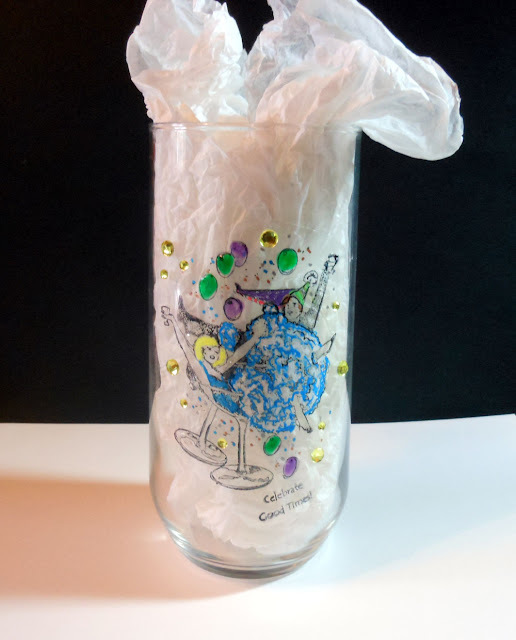 I used it for the balloons and the clear for the cups. To adhere to glass, cut Miracle Tape Sheet a little bit bigger than the image. Remove first protective liner and slowly adhere acetate image to cut Miracle Tape Sheet. Press in place. Remove second protective liner and press onto glass. Add dots of metallic Gelly Roll for the confetti and a few Rhinestones to complete the cup. Festive and fun - great decor' for the home! Have a Happy, Safe, and Blessed New Year's!!! May everything come your way that you want...including VLVS stamp images!!!! This little guy exemplifies my Worry about the New Year! Technique: I Folded Large Clock Paper to fit my design and added my ephemera. I then trimmed the remainder of the clock to card size. I stamped all of the stamps on an Oat Meal colored card stock. I stamped the Angel Baby and the Winged Clock twice. I removed the wings from the baby and replaced them with the watch wings. I then cut the Baby's face and arm unit from the second baby along with the upper leg with foot and placed them on the original baby with foam tape. 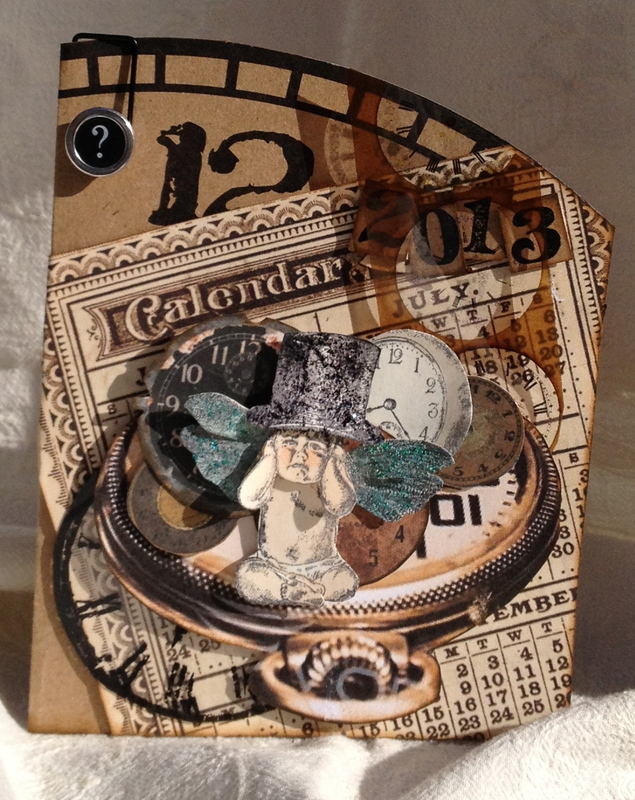 I placed the second clock with my ephemera in the back ground unit. I stamped the Top Hat and placed it on the baby's head with the foam tape. I used black stickles on the top hat and teal stickels on the wings. Everything was adhered with foam tape giving it dimension. 1. Take a cheap paint brush (for house painting) and dip it in to the gesso, make sure to cover the whole brush and between the bristles. Let dry for a couple of days. It will take a while to dry through and through. 2. Paint the whole brush, except for the top handle because I liked the colour, with white acrylic paint. Dry with you heattool but keeping it a little to close to your work, so the paint with bubble and blister, it makes awesome texture. 4. Put aside for a little while. 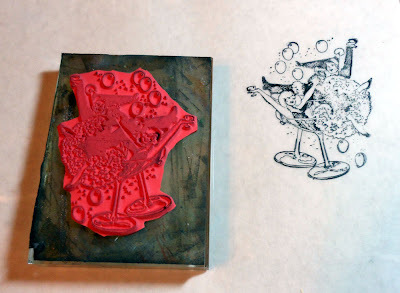 Now you start on working on the stamped images. Take a piece of tissue paper and stamp the bird 19001 and the text Time Flies 19008 with Stazon Black. Cut the image out as near to the image as possible. 5. Take some gel medium and brush it onto the back of the stamped tissue paper and layer it down onto your brush. Do this very careful because the wet image is very delicate and will easily tear. I cut the two words apart so I could place each one of them on a spot I liked most. Give the beak and the feet of the bird some colour, I did this in red because it matches the top of the handle. 6. Make some shadow around the bird and the words with the deluted black acrylic paint. 7. Finish it of at the top with washi tape. And wrap the berries on metal wire around the handle. Hope you all will have a great turn of the year and I want to wish you a very Happy New Year!!! 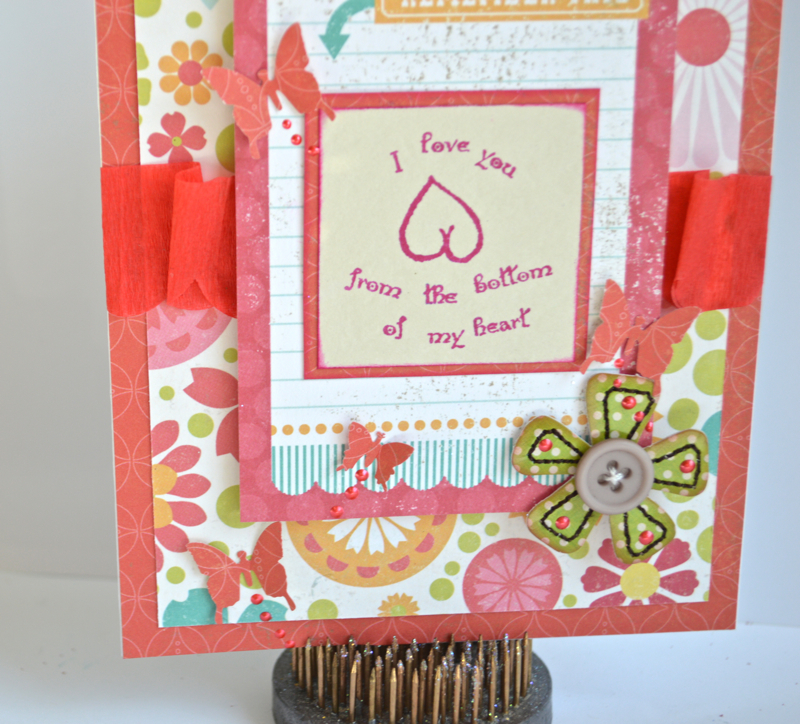 Layout x2 by Guest Designer Louise Nelson! Today I bring the last post by Guest Designer Louise Nelson, and she has TWO layouts to share!! And Louise says "For this layout and the next I have used the stamps to create subtle background patterns with clear embossing, which I have then highlighted with the use of water color paint and mist." A big round of applause to Louise for sharing her beautiful work with us this month!! Thank you so much!!! My Christmas evening was spent putting together a card for the New Year. It's hard to believe that we are just a few days out from ending one year and beginning another...talk about a wonderful time of transition lodged between two exciting holidays! For this I had to use the Moon Lady (Sleeping Lady Moon) who has been on my desk for a few months now, patiently awaiting her turn for ink and paper. I also used my favorite image, Grumpy Moon (Scowling Moon) and a lovely new-to-me Happy New Year expression stamp. Both Lady Moon and Grumpy Moon were stamped and embossed with Stampo's Ultra High Gloss Embossing Powder on Kromecote paper. I trimmed both and colored in each with Copic markers. From there, I layered various decorative papers and applied a splash of glitter glue to punched snowflakes. The year 2012 is rapidly coming to a close and it is this time of the year that makes me think more than anything about new goals for the new year. I am reminded of last year's goals. I always like to see how I did at completing the tasks at hand and then I move forward with a shiny brand new set of goals and tasks to attempt for the new year. Since I always begin by looking back, I am reminded of how swiftly this year went. Viva Las VegaStamps has many stamps to help convey that! 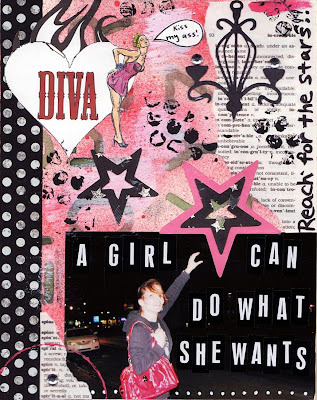 Today I share with you an art journal page I made as I meditated on last year's accomplishments and brevity. Mists and reinker were layered and dried with a heat tool. 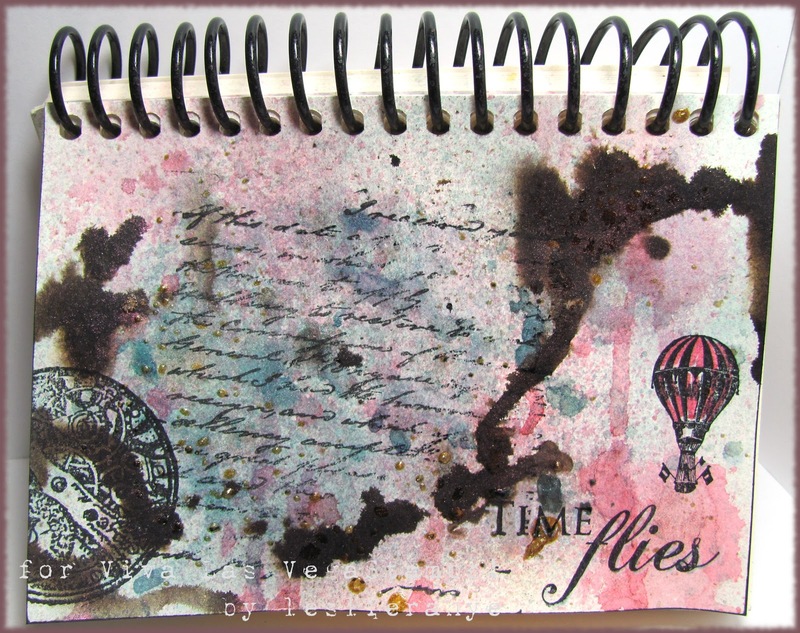 Images were stamped with Archival ink and then markers were used to highlight the balloon stamp and to edge the journal page. WHO has Returned for CHRISTMAS in CHICAGO! MERRY CHRISTMAS and welcome to Viva Las Vegastamps!!! 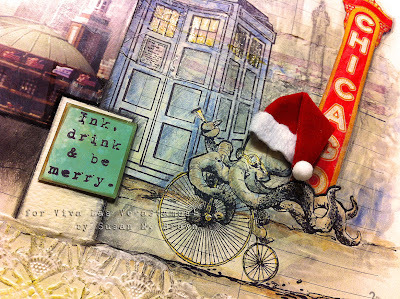 Susan your Chief ELF here and today I am bringing you some inky inspiration... to Ink, Drink and be MERRY! I am in my hometown of Chicago for Christmas and of course, I had my brand new stamps sent to meet me there. 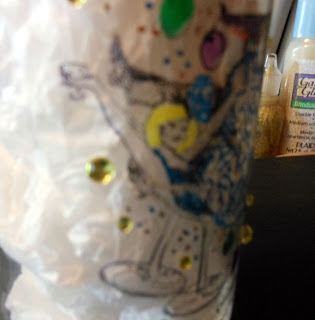 So today I have created a page in my Christmas SMASH book Travelogue that I started the other day on the Saturday Crafts Fair and I showed how I made my own VLVS! Tissue Tape using Miracle Tape and the Jingle Bells #10686 stamp. that has been turned into one of the new Viva Las VegaStamps!!! Stamps used: Jingle Bells #10686 to create Tissue Tape on Miracle Tape and three stamps from Plate #909: Blue Police Box #19054, "Otto's Sweet Ride" #19049, and quote "Ink, Drink & Be Merry #19058". I am working in this book like a Smash book crossed with an art journal and I am totally having fun with it. I painted my recycled 1998 calendar with a gesso mixure, then I collaged my tissue tape, paper scraps and parts of fussy cut sightseeing brochures - all nestled amongst my stamped images. I used my Ranger Distress Markers to color in the images and paint in a faux skyline. 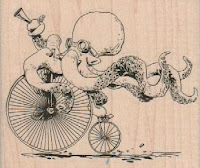 The finishing touch is a Jolee's Santa cap to adorn "Otto the Octopus", one of Brian Kesinger's illustrations on Plate #909. My husband and I spent the day walking around downtown soaking in the sights and this is the perfect end to a day filled enjoying the Christmas spirit. Merry Christmas! Look WHO's Visiting the WINDY CITY! I hope you have a wonderful Holiday with family and friends today. Thanks so much for dropping by. If you have a little time... check out what the rest of the Viva Las Vegastamps! Design Team has been up to. Or if you have a VLVS! gift certificate in your hands - head on over to the Viva Las Vegastamps! store - for all your stamping needs and for every occasion...and MIRACLE TAPE, too! 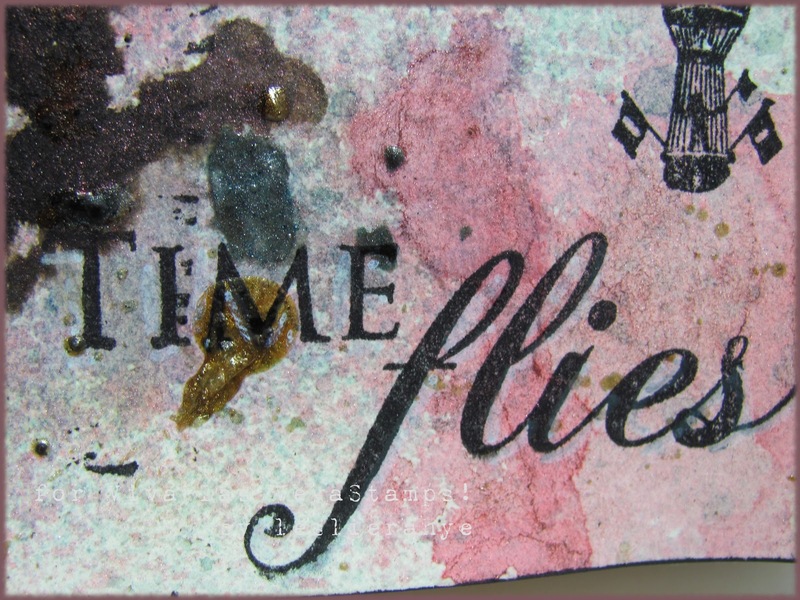 Judy here, this is a tag I made using three VLVS stamps! 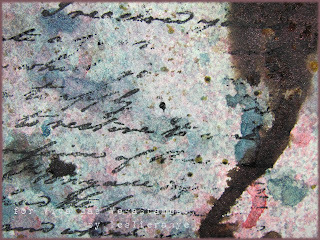 Broken china and tumbled glass distress inks were used to color #8 manila tag. Ink Christmas tree #18932 with Memento bamboo leaves and stamp on tag. 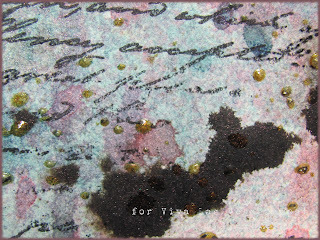 Throughly heat set to dry tag before stamping December and 25 from December Daily with antique linen, while ink is wet pour ultra high gloss clear embossing powder over the inked images, pour off extra and heat set to a high gloss finish. Vintage photo distress stain was used to color the die cut deer, let dry or heat set, secure tinsel twine with Miracle Tape on deer. Apply deer to the tag with glue n' seal. Blue star bling was added to the top of tree. Blue tinsel twine was added to top to finish this tag. Its the the Holiday Season! This year I deiced to make some Christmas cards using Viva Las VegaStamps! of course! This first card is a quick fun card I made using Kromecote and Ultra High Gloss clear embossing powder for a fun emboss resist technique. 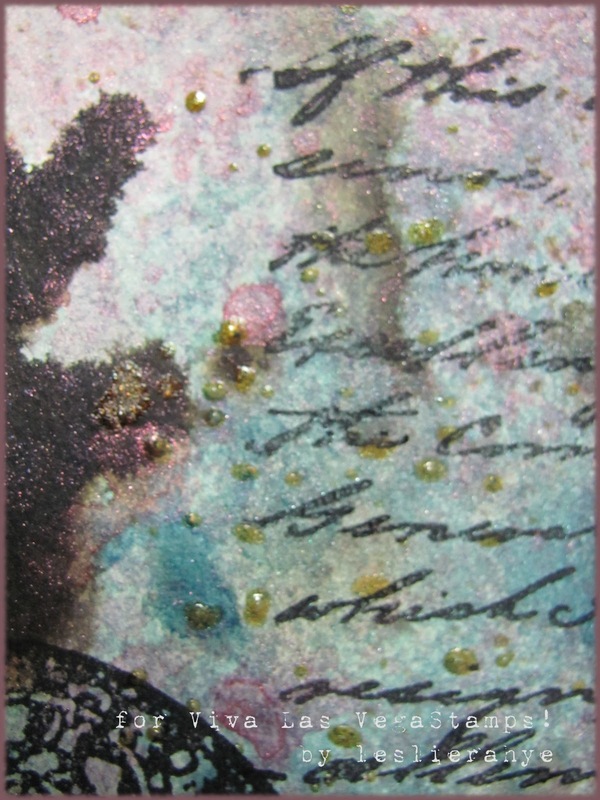 I stamped the Harlequin Diamond background stamp in clear embossing ink on the Kromecote. I poured the Ultra High Gloss embossing powder over it. 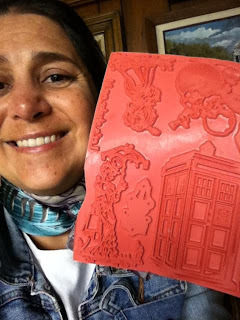 After I melted the embossing powder with my heat gun, and it cooled, I took Barn Door distress ink pad and one of the foam pieces and went over the embossed image with the ink. 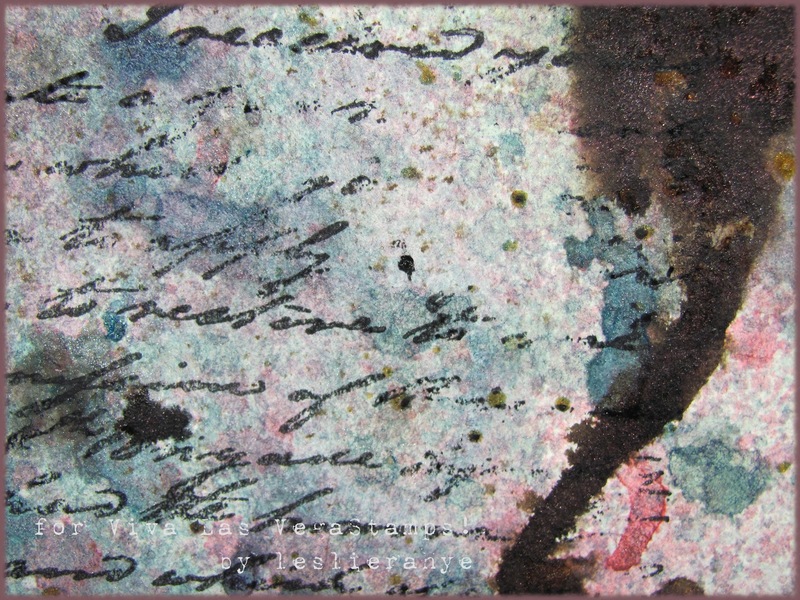 I then took Fire Brick distress ink pad and did it again. I then took a paper towel to wipe off the ink from where it is embossed. it looks like this. I trimmed the Kromcote a pit so it can fit on the Kraft card base. I used Miracle tape to attached the Kromecote to the card base. On white cardstock I stamped the Snow woman in flower hat with black Memento ink pad. I colored her hat and purse with markers. I stamped the head part of the stamp and painted the nose orange. I cut it out and glued it on her. I glossy accented the band of the hat and her eyes. I added some rock candy stickles to her body. I used foam tape to attache her to the card. 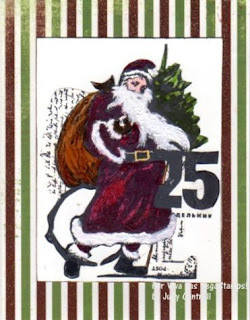 On a piece of scrap cardstock I stamped the sentiment, "have yourself a merry little Christmas" and edged it with Crushed Olive distress ink pad. This card is another fun card to make. Its a triple stamping card technique I saw a friend make one, then saw a youtube video on where she got the idea from. While watching her make the card I got an idea to use a VLVS! stamp with it. Turned out really cute! This is what it looks like uncolored. Taking a cue from George of the Jungle I stamped out "Watch out for that plane George" with the small alpha's from the plate 1430 on scrap of white cardsock with black soot distress ink pad. cut the words and mounted that on the bottom white layer. Hi Judy here, I just love how this card turned out with Santa and the designer paper! Is everyone ready for Christmas! I've had fun playing with this jolly Santa! If you recall, I used this image on my canvas last month. This time I'm using a different coloring product. The Santa image #18933 was inked with archival black on Kromecote and then Copic markers were used to color image. White paint was used on beard and trim. The image was cutout and then applied to a piece of white card stock. Cut designer paper 5 ½” x 5 ½.” Use scoring tool to score 1”on left side and fold back. Use Miracle Tape to adhere the 1” piece to folded card to finish. The End Of The World?? Then Let's Say I LOVE YOU! everyone I love a CARD! I mean that is the most important thing right? Why not say it with some sass! 1. Trim out 6X9 white cardstock base. 2. Trim out 2X2 cream card stock. 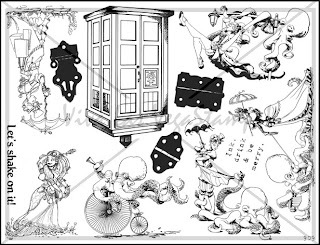 Plate 1302 Item 16351 onto cream cardstock. 4. Trim out 2 1/4X 2 1/4 happy color patterned paper. 5. Adhere sentiment onto patterned paper. 6. Trim out 4.5X6" patterned paper and 4"X5.5" contrasting patterned paper. 8. Add crepe paper ruffle to middle of card as shown. 9. Adhere sentiment onto journaling card. 10. 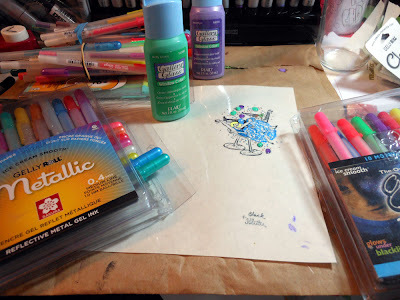 Using foam pop dots to pop journaling card into card center. 14. Add Liquid Pearls for some happy cheer! Thanks for being a Viva Las VegaStamps fan! And we hope to see you tomorrow!!! Hi there, Glenda here with a little Christmas humour. If you know me then you know that I love getting a little naughty with the stamps which is why the Naughty Lady stamp was perfect for this humorous ATC. December Guest Designer.. Louise Nelson!!! Put on your Yamaka it's time for Hanukkah! My VLVS! 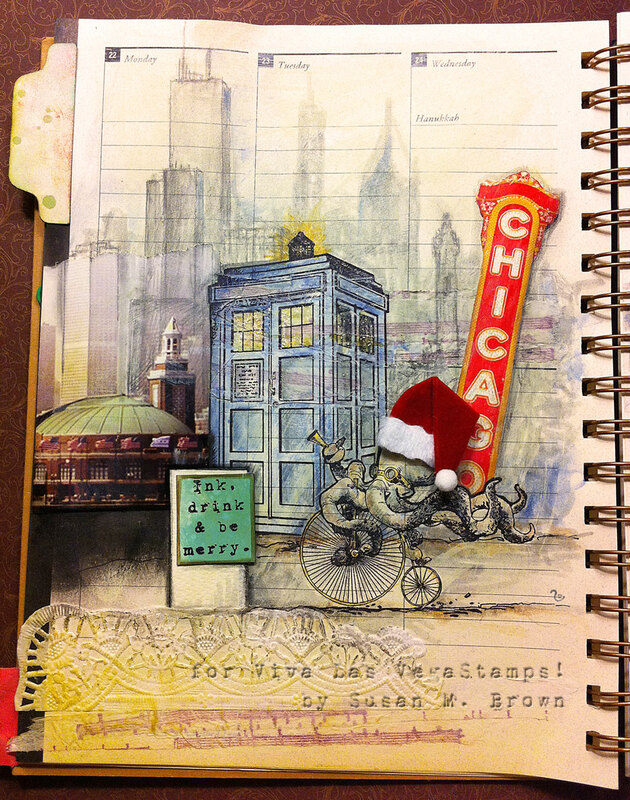 Christmas Smash Journal! a 12x12 Layout with VLVS!